Cody and I got into an argument about a week ago and at one point Cody mentioned that he felt like I did not appreciate what he was doing for our family. It stopped my mind and heart in its tracks. It pains me to think that Cody does not feel appreciated because I am keenly aware of how much he does for me and the girls every. single. day. On any given day Cody is the first to wake up, helps get Jane ready for school with me, sometimes makes breakfast, goes to work all day and then helps with dinner, sometimes homework and bedtime routines which includes reading scriptures, singing, prayers and constant random requests that are just ways to get out of going to bed. And, if that isn’t enough he doesn’t complain about helping! The best change with the passing of time is the true teamwork that is required of parents now. The jobs of families and homes are more shared and the boundaries of what a man or women should or should not do blurred. My husband takes care of diapers, meals and all sorts of other historically “domestic” work, along with his full day of working with customers, research welding and paperwork. I am thankful to live in a time where I feel compelled out of love and gratitude to respect and honor my husband, not simply because I should or because I don’t have another option. I remember reading an article about a wife who realized one day as she was folding her husband’s laundry how thankful she was for what he did to provide for the family. I recently have seen Cody differently too. I see the holes in his jeans and welding shirts. I see the worn toes of his boots and I know there is frustration from work he sets aside to offer me and his daughters love and support. He is a good man. I hope that all husbands are in awe and admiration for what their wives do and all wives are in awe and admiration for what their husband’s do. This mutual appreciation and respect only encourages love and a willingness to keep marriages, homes and families healthy and happy! 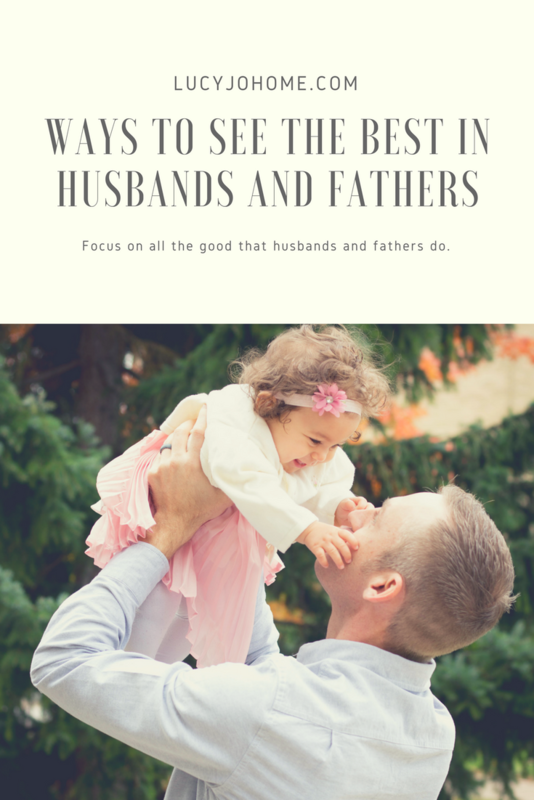 The following are ways to see the best husbands and fathers. How can you see your husband differently? What does your husband do that makes you so grateful you picked him? Notice what others say about your husband. Imagine what a typical day would look like without your husband. Literally sit down and list out all that your husband does for you and the family generally and specifically. Take time to verbally or in writing thank him for something specific that he does. Surprise him by giving him a break doing something you know he doesn’t love but does as a service to you. For example, maybe he hates to do the dishes, but does it anyways, so you do it for him so he can do something else. Help the kids write out fun notes of love and appreciation and have them present them to him. Listening to the positive things your kids have to say about “dad” will open your eyes. Plan a fun date with only him in mind. This means maybe doing something you are not crazy about, but know it would be fun for him. Don’t wait for your husband to feel under-appreciated; tell them today how you feel about their love and service for you and the family! Offer a massage or other special treatment. Here are more ideas for ways to show your husband love and appreciation. I know I need to use these ideas! This is soooooo good! I think I could definitely tell my husband how much I appreciate him more often. Thank you for sharing !